Select Hinges SL11 SD 83" Standard Duty, for medium frequency doors up to 300lbs Concealed Flush Mou.. Select Hinges SL11 SD 95" Standard Duty, for medium frequency doors up to 300lbs Concealed Flush Mou.. 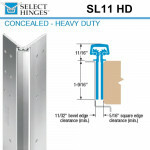 Select Hinges SL11 HD 83" Heavy Duty, for high frequency doors up to 600lbs Concealed Flush Mounted .. Select Hinges SL11 HD 95" Heavy Duty, for high frequency doors up to 600lbs Concealed Flush Mounted ..
SL21 SD Select Hinges 83" Full Surface Hinge, Swing Clear, For Doors Less Than 2"
Select Hinges SL21 SD 83" Standard Duty, for medium frequency doors up to 300lbs Full Surface Swing ..
SL21 SD Select Hinges 95" Full Surface Hinge, Swing Clear, For Doors Less Than 2"
Select Hinges SL21 SD 95" Standard Duty, for medium frequency doors up to 300lbs Full Surface Swing ..
SL21 HD Select Hinges 83" Full Surface Hinge, Swing Clear, For Doors Less Than 2"
Select Hinges SL21 HD 83" Heavy Duty, for high frequency doors up to 600lbs Full Surface Swing Clear..
SL21 HD Select Hinges 95" Full Surface Hinge, Swing Clear, For Doors Less Than 2"
Select Hinges SL21 HD 95" Heavy Duty, for high frequency doors up to 600lbs Full Surface Swing Clear.. 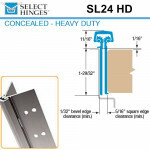 Select Hinges SL24 SD 83" Standard Duty, for medium frequency doors up to 300lbs Concealed Narrow Fr.. Select Hinges SL24 SD 95" Standard Duty, for medium frequency doors up to 300lbs Concealed Narrow Fr.. 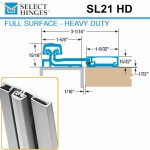 Select Hinges SL24 HD 83" Heavy Duty, for high frequency doors up to 600lbs Concealed Narrow Frame L.. 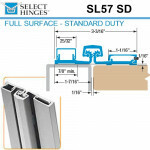 Select Hinges SL24 HD 95" Heavy Duty, for high frequency doors up to 600lbs Concealed Narrow Frame L..
SL57 SD Select Hinges 83" Full Surface Hinge, Narrow Frame, For Doors Less Than 2"
Select Hinges SL57 SD 83" Standard Duty, for medium frequency doors up to 300lbs Full Surface Narrow..
SL57 SD Select Hinges 95" Full Surface Hinge, Narrow Frame, For Doors Less Than 2"
Select Hinges SL57 SD 95" Standard Duty, for medium frequency doors up to 300lbs Full Surface Narrow..
SL57 HD Select Hinges 83" Full Surface Hinge, Narrow Frame, For Doors Less Than 2"
Select Hinges SL57 HD 83" Heavy Duty, for high frequency doors up to 600lbs Full Surface Narrow Fram..
SL57 HD Select Hinges 95" Full Surface Hinge, Narrow Frame, For Doors Less Than 2"
Select Hinges SL57 HD 95" Heavy Duty, for high frequency doors up to 600lbs Full Surface Narrow Fram..